One of the most interesting papers ever written about the Bitcoin block-chain design is “Accelerating Bitcoin’s Transaction Processing” by Sompolinsky and Zohar. The paper presents the GHOST protocol which aims to achieve higher TPS securely by changing the way nodes decide which is the best chain fork. The authors try to reduce the block rate to 1 second, increase the TPS and try to keep the network stable. One of the issues that is not considered by the paper is the existence of a selfish bias independent of the miner’s hashing power. When a miner solves a block, and a competing block is also received, the miner will mine on top of his own solved block. This is not only a consequence of the best-chain selection policy, there is a strong incentive to do so. By mining on top of your own solved block, you double the expected reward while keeping the same winning probabilities. As a informal comparison, in Satoshi’s security model, the rogue miner is irrational and malicious. For example, the confirmation interval computations assume a rogue miner having 10% of the network hashing power will try to mine a selfish chain in order to try to outperform the global best-chain even if the odds are against him. In Sopolinky/Zohar security model, the miners are rational, but use a sub-optimal strategy. For example when two blocks compete, all miners will chose one of them arbitrarily (all choose the same block). Although this may be optimal for a fully cooperative network it’s not what miners will optimally choose for themselves. In Eyal/Sirer security model, the rogue miner is rational and uses an strategy believed by the authors to be optimal. 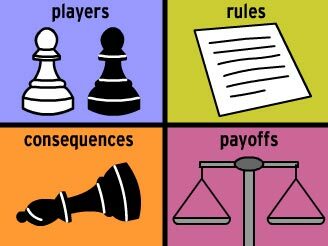 In this post we improve Sopolinky/Zohar model assuming the attacker uses Eyal/Sirer selfish strategy and the standard double-betting strategy. The double-betting is a mining strategy pre-programmed in the in Satoshi reference miner. When a miner mines a block and a competing block is also detected, the miner won’t switch to the other chain because is has the same length, so mining will continue on the “selfish” fork. Of course there is nothing inherently selfish with this strategy since the miner has not enough information about which of the two forks is the one which the majority of the miners are mining on top of. Nevertheless the division of hashing power in forks is against the common good and reduces both the network TPS and the network confirmation time. Sometimes a miner may solve two blocks in a row without noticing that the first one had a conflicting sibling. Then the competing miner would retaliate. If more than two miners are competing, it’s more complex to decide which block should be chosen as parent. All miners must dynamically maintain information of all previous interactions between all other miners. Some miners want to preserve anonymity and won’t publish identifying information. The first two reasons can be disregarded since the conflicting events may have a very low probability. The third is only a minor technical difficulty. But the last reason may be very strong. I present here a reward strategy I called DECOR that incentives resolving conflicts in a deterministic way that benefits all conflicting miners at the same time. This strategy practically eliminates any possibly block-chain reversal when miners are rational. To make this explanation clearer we’ll assume that all block rewards and fees are equal so each miner receives exactly the same net payment for a block. Also the reward percentages proposed can be varied as long as some relations between are maintained. The idea is that whenever two miners Alice and Bob mine two competing blocks (a block conflict) both decide to mine on top of the block with the lower hash. First, all conflicting blocks headers that are not very old are forwarded to allow all peers to compare block hashes. If a miner Carol (or Alice or Bob) solves a following block, she includes in his block a reference to the uncle block header that was left out of the main chain. This reference is stored either in the block header, the coinbase field or in a special transaction. The uncle block owner will get automatically approximately 50% of the reward (sell formal description below) of his main-chain sibling if if uncle hash is higher than sibling hash and a bit less if not. The sibling also pays 10% to Carol. Also the sibling burns 10% if the sibling reward if hash is higher than the sibling hash or a bit more if it’s not. This strategy sets incentives for conflicting miners to choose always the parent with the lowest hash and to always reference a lost uncle in the following blocks. Add a reference to Y in the new block that is being prepared. pay the remaining coins to the same address as the input address. All users accept this transaction as valid even if it’s unsigned if a correct uncle is referenced. Edit: there was a typo in the previous definition in the computation of q in line 6 (0.2 factor typed instead of 0.3). It’s fixed now. The following diagrams show an example of how two miners Alice and Bob will prefer mining on top of the same parent (A1) after a block A1 (created by Alice) is in conflict with a block B1 created by Bob. Carol is a third miner that is not in conflict with neither Alice nor Bob. In the diagrams the first letter indicates who created the block and the number following indicates the block height. The arrows point to each block parent. 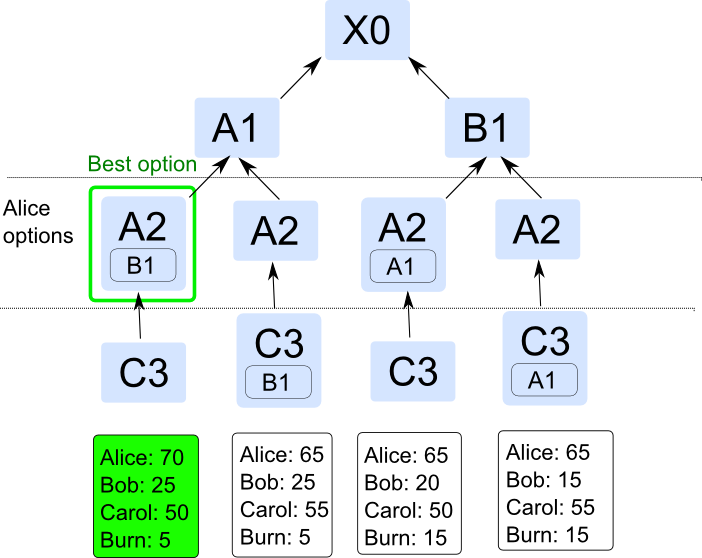 Although I’m giving no formal proof, It’s evident that the best strategy for Alice and Bob is to choose the same parent for the following block. The DECOR strategy can be implemented along with the GHOST protocol. In fact both protocols have things in common, such as the need to forward block headers that are siblings of blocks in the best chain. Using both protocols together, along with route optimizations proposed here, maybe 2000 TPS can be achieved today with a very low block rate. Implementing GOST+DECORE was not in the feature list planned for the first release of NimbleCoin. Nevertheless, I will implement it and test it so if the network is more stable I will merge the change in the next programmed hardfork release of NimbleCoin. This entry was posted on May 2, 2014, 5:19 am and is filed under Uncategorized. You can follow any responses to this entry through RSS 2.0. You can leave a response, or trackback from your own site.